When I began building last year’s set of Study Guides, I devoted a post to the Wordles which we include as part of the Basics unit. ASC Education uses Wordles as a device to introduce students to the idea that Shakespeare’s language is their language, that the vocabulary is familiar, not alien. Handing students who are new to Shakespeare a block of uninterrupted text can be intimidating, and the so-called “line of terror” at the bottom of many editions only augments the students’ assumptions that they won’t understand without explanation. Breaking the words down through a Wordle, however, demonstrates the accessibility of the language. In most instances, the only completely unfamiliar words will be proper nouns — place names and character names.  When students find a challenging word that is not a proper noun, we tell teachers to move back to the text itself; usually, the word’s meaning is apparent in context. This method is an easy introduction to Shakespeare’s language and can help remove some of the fear that many students experience when first engaging with the text. Last year, I discovered that Wordles of the first 100 lines can also illuminate something about the plays themselves, as well as what Shakespeare seems to be calling attention to in the first five minutes of a show. 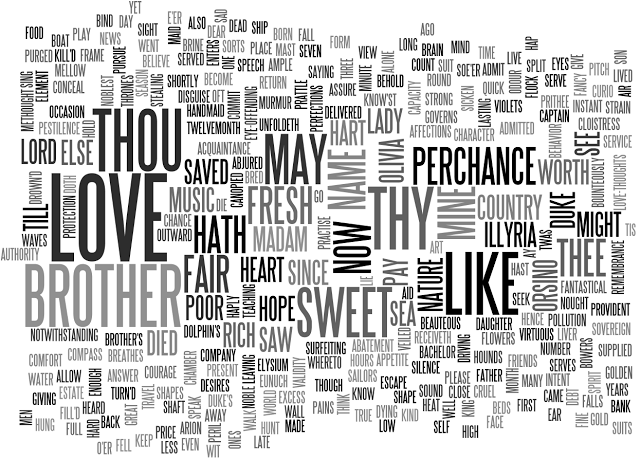 As I begin working on the 2012-2013 set — Twelfth Night, Romeo and Juliet, The Merchant of Venice, and The Two Gentlemen of Verona — I’ve started constructing a new series of Wordles. So, as a bit of a teaser for these upcoming Study Guides, I thought I would share the discoveries I’ve made in these new examples. The first 100 lines of Twelfth Night stretch over almost two full scenes: Orsino lamenting to his court about Olivia’s persistent rejection, and Viola the Illyrian shore, mourning her supposedly drowned brother. The biggest words here are “love” and “brother”, and those clues wrap up the relationship dynamics of the play pretty succinctly. Both have a focus in both of the opening scenes; Olivia has recently lost her brother, and uses that as the basis for rejecting Orsino’s suit, and Viola thinks her brother Sebastian has drowned. The other words that stand out to me are “may” and “perchance.” There’s an emphasis on the subjunctive mood, which, in a strange way, sort of highlights the impermeability and the uncertainty that dominates this play. The subjunctive mood is one of desire and doubt, wishes and maybes. Everything is “perchance;” everything exists on unstable ground when we start, and the lines of certainty only become more blurred as the play goes on. 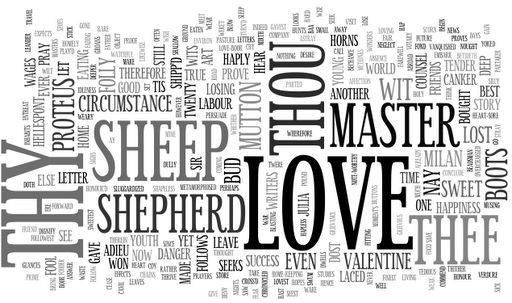 I think, from this Wordle, you get a sense of the challenging atmosphere in the first 100 lines of this play. 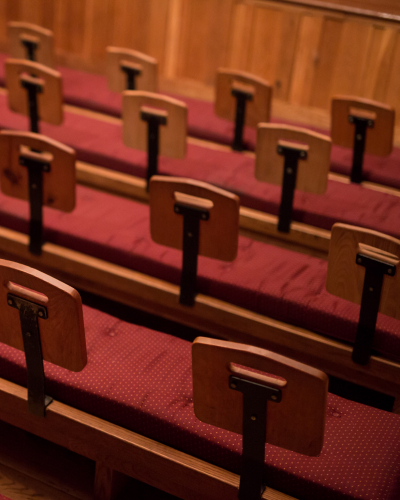 We see a lot of address happening — “sir,” “thou,” “thee” — so we know, right off, that characters are speaking to each other and that they are, judging by the pronouns, being informal. 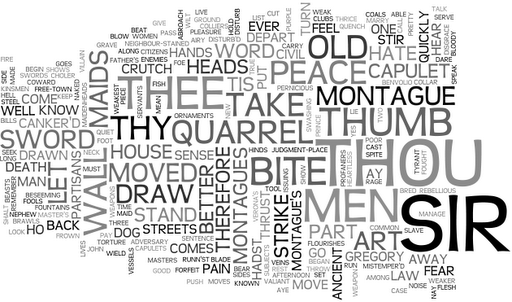 We also see a lot of active verbs, such as “bite,” “draw,” “stand,” and “strike,” as well as other words indicative of a fight — “sword,” “quarrel,” “hate.” The first 100 lines of Romeo and Juliet set a mood of combat and aggression, and that much is evident in the vocabulary Shakespeare uses. We also get the names of the factions involved, the Capulets and Montagues. Why did this crack me up? 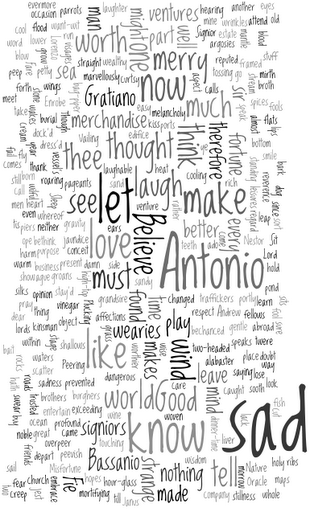 Well, as I’d been looking over these first 100 lines, I turned to Sarah and said, “It feels like all anyone does in the first scene of this play is walk up to Antonio and say, ‘Hey, man, you look terrible, what’s wrong?’ Seriously, it just keeps happening.” And then I did this Wordle, and lo and behold, our largest words? “Sad” and “Antonio.” The Wordle verifies my perception of what’s going on in this opening scene. 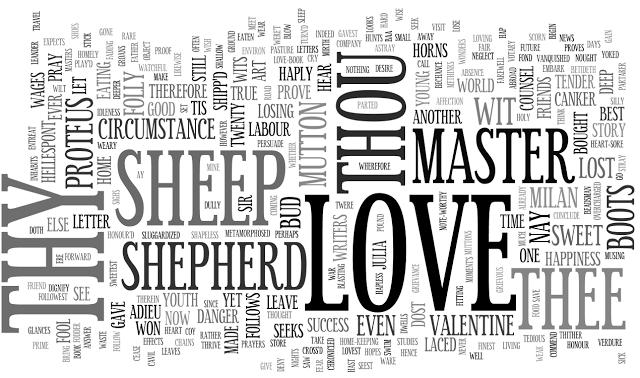 Apart from that, we see a lot of other words related to emotions — “laugh,” “merry,” “love,” “like,” “wearies,” “melancholy,” — as well as some words introducing the mercantile aspect of the play: “worth,” “ventures,” “merchandise,” “fortune.” It’s interesting to me that Shakespeare foregrounds both of those spheres in these first five minutes, demonstrating the complicated links between love and fortune (and between personal merit and financial worth) right from the start. And I have play’d the sheep in losing him. It shall go hard but I’ll prove it by another. Proteus and Speed engage in stichomythia, the rapid exchange of lines (as do Sampson and Gregory in the beginning of Romeo and Juliet), and they layer this with punning and repetitions, including antimetabole, the repetition of words in inverted (A-B-B-A) order. 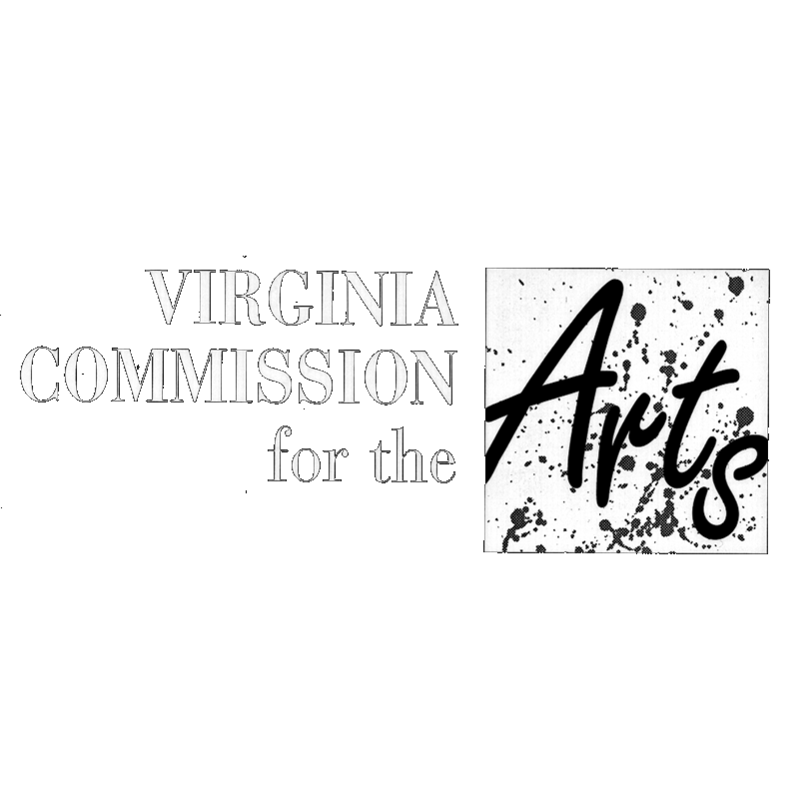 The prominence of those terms in the Wordle, then, doesn’t introduce us to a large overarching concept of the play, but it does hint at what the tenor of the play will be. This sort of bantering humor continues throughout the text, between many different characters. The biggest word in this example, though, is “love” — right from the beginning, that’s what Valentine and Proteus are talking about, and that’s what they’ll keep talking about throughout the entire play. The tensions between romantic love, friendly love, and self-love are what drive this play, and Shakespeare opens by having his two male protagonists discuss when love is real and when it isn’t, during which they repeat the word “love” seventeen times. Since ASC Education began using Wordles as a tool in our Study Guides, we’ve had great responses to them. These are a great way for a teacher to begin the class discussion of the play on an accessible level, easing students away from their fear and into a discussion of the text. For more information, check out our Study Guides, available as PDF downloads or print-on-demand hard copies through lulu.com.